The Underworld was the realm of Hades in Greek mythology, and the locale for all elements of the Afterlife. This domain of Hades had its own particular geography, although the characteristics of it differed between ancient writers, for it was a realm on which no mortal would see to report on. Some features though were agreed upon, for it was said that there was a region known as Tartarus, a region called the Asphodel Meadows, and an area called Elysium, it was also said that there were five Rivers of the Underworld. The five Rivers of the Underworld would criss-cross, and flow around, the Underworld, and were named as the Acheron, Styx, Lethe, Phlegethon and Cocytus. In antiquity, the River Acheron was the most prominent, and important, of the five rivers of the Underworld, and in some ancient texts it was said to be only slightly less important than the earth encircling river Oceanus. The River Acheron was perceived to be a physical barrier between the Underworld and the mortal world, for mortals could not cross it to enter the Underworld, and the dead could not cross it to escape. To this end, Hermes, Thanatos, or another Psychopomp, would bring the souls of the deceased to the bank of the Acheron, and the Charon, the ferryman, would transport the souls across the river on his skiff. Transport was dependent upon payment though, for during funeral rites, coins would be left in the eyes, or mouth, of the deceased. Those who could not pay would be left to wander aimlessly along the bank of the Acheron, and could possibly give rise to ghosts in the mortal realm. It was also along the far bank of the Acheron along which Cerberus, the triple headed dog, would patrol. The Acheron would be called the River of Pain, or Woe, in Greek mythology. Nearly all rivers in Greek mythology had a Potamoi, a river god, associated with them, and originally the Acheron has a son of Oceanus associated with it. In later mythology though, Acheron was actually named as a son of Gaia and Helios who was transformed into a river as punishment by Zeus, for this Acheron had given water to the Titans during the Titanomachy. 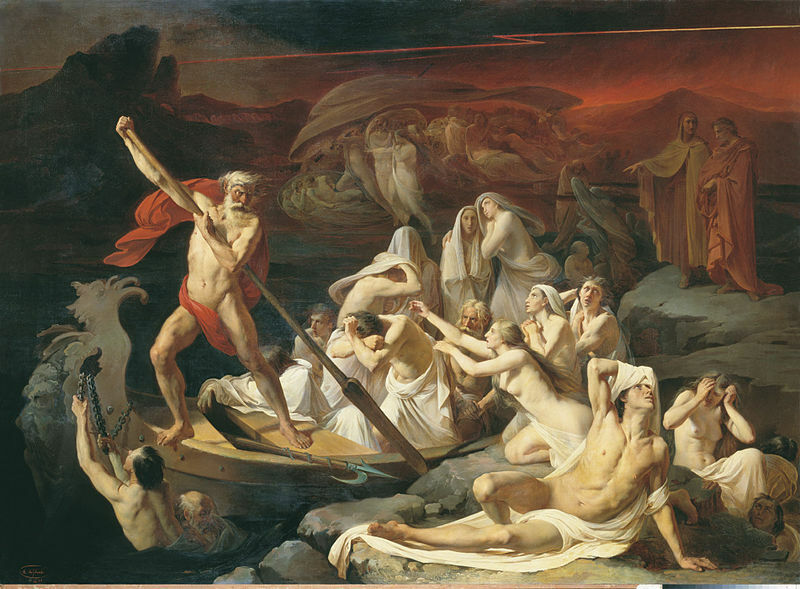 The river Styx is arguably more famous than the Acheron, and as a result many of the myths connected with the Acheron have been transplanted onto the Styx. The Styx was said to have circled the Underworld seven, or nine, time, having emerged first from the Acheron. 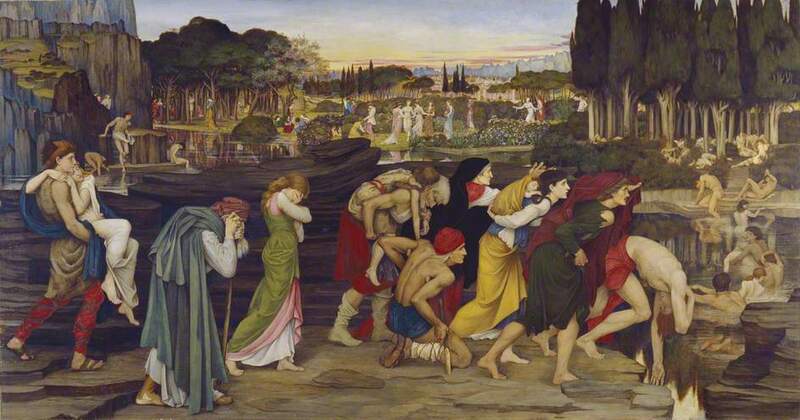 Named as the River of Hate in Greek mythology, the River Styx was considered a river of punishment. The Styx did not have a Potamoi connected with it for instead there was a daughter of Oceanus, an Oceanid, called Styx who was associated with it. During the Titanomachy, the Oceanid Styx was the first ally themselves with the cause of Zeus during the Titanomachy, for which she was honoured. Thereafter, swearing upon the name of Styx, was part of an unbreakable oath, and those that did break the oath would drink from the Styx’s water, leaving them unable to speak for seven years. The name of the Lethe is not as recognisable today as that of the Acheron or Styx, but in Greek mythology the River Lethe was the River of Forgetfulness. In the Greek Underworld, the River Lethe would flow across the plain of Lethe, and pass around the cave of Hypnos, thus the river was closely associated with the Greek god. Those souls who were to spend eternity in the greyness of the Asphodel Meadows would drink from the River Lethe forgetting their previous life. Drinking of the Lethe would become increasingly important when the idea of reincarnation became more prevalent in Ancient Greece. Nominally there was a Potamoi named Lethe, but there was also a daemon, a minor Underworld goddess called Lethe, who was the personification of Forgetfulness. The River Phlegethon was the River of Fire in the Underworld, and thus this river was also known as Pyriphlegethon. The Phlegethon was a river associated with Tartarus, the deepest element of the Underworld, and was therefore, like the River Styx, considered to be a river of punishment. It was thought that some of those being punished in Tartarus would find themselves tortured in the boiling waters of the Phlegethon. There was also considered to be a Potamoi named Phlegethon, although the River god was not mentioned as an individual in surviving stories of Greek mythology. The fifth river of the Greek Underworld was the Cocytus, the River of Lamentation in Greek mythology. Like the Phlegethon, the River Cocytus was a river described as flowing through Taratrus, and was a river where the punishment of murderers was undertaken. In alter mythology it was said that it was along the banks of the River Cocytus, rather than the Acheron, that those lost souls who could not pay the fee of Charon were said to be found. In some tales though, the Cocytus is considered not to be a river but rather a swamp or a marsh. There are other water sources that appear occasionally in stories of Greek mythology, including rivers named Alpheus and Eridanos, although both were commonly considered to be rivers found outside of the Underworld. There was occasionally said to be a lake in the Underworld, the Acherusian Lake into which the Acheron flowed, whilst the Styx and Phlegethon encircled. This lake was said by some to be the water source across which Charon plied his trade. The Underworld was also said to be home to the Stygian marsh, the place in Hades where all the main rivers met.